THE CLERGY OF MAGHERAGALL PARISH. By Rev. W. H. DUNDAS, B.D. Edward Johnson, B.A -- 1757. He was the eldest surviving son of the preceding vicar, and succeeded his father in 1757, having taken his degree of B.A. in 1755. He died at Lisburn in 1765 in the 30th year of his age, and was buried at the east gable of the church in the churchyard of Magheragall. Henry Reynett, B.A. -- 1765. This vicar was also connected with the Ballymacash family, having married in 1761 Henrietta Johnson, eldest surviving daughter of Rev. Thos. Johnson. He was the son of Lieut. Henry Reynett, and was born at Sandhills, Co. Monaghan, in the parish of Galloon, in 1736. His name appears once in the Magheralin Vestry Book as signing the minutes of the Easter Vestry in 1766 -- "Hen. Reynett, minister." Perhaps he had been curate there before his appointment to Magheragall in 1765. He became vicar of Glenavy in 1777, where he was succeeded by Rev. Samuel Dubourdieu in 1780. He then was appointed vicar of Billy, which he resigned in 1790. There is a fine oil portrait of him at Ballymacash. He belonged to a Huguenot family, which settled in Waterford -- possibly Henry Reynett and Susan Taboys, whose marriage licence is dated 1726, were his parents. Doctor Jacques Reynette as a boy fled with his father, Henri de Renet, from Languedoc in France at the outbreak of persecution. The family estates were restored in later years to a senior branch. Doctor Jacques Reynette was buried in 1720 in the French Church at Waterford. This vicar only held Magheragall for about a year. He went to Aghalee in 1778, where he was vicar in 1818, and probably to 1834, when Rev. Robert Hill was appointed. Possibly he was the son of Rev. Philip Fletcher, who was rector of Dromore and treasurer in 1736. This Irish branch of the Pattens is said to be descended from the brother of William Patten, of Waynflete, Lincolnshire, who founded Magdalen College, Oxford, in 1458. Rev. Francis Patten's eldest brother Joseph lived at Knockmore -- this house got the reputation of being haunted, and is now a ruin. Another brother, Thomas, lived at Rosevale: a third, William, married the daughter of Attorney-General Wolfe, of the same family, to which the famous General Wolfe, the victor of Quebec belonged. The daughter of another brother, John, was married to Thomas Addis Emmett, brother of Robert Emmett; and a fifth brother, James, before his marriage sailed round the world with Captain Cook in H.M.S. Resolution. With the curiosities he brought home he helped to found a museum in T.C.D. The foregoing particulars were contributed by his great granddaughter Miss Jenkins. Rev. Francis Patten lived at Streamville, and evidently held extensive lands. In a list of farms in Magheragall in 1778 he appears as occupying 52 acres in Upper Magheragall, as well as about 52 acres contiguous to Greerstown. He had a private walk to the church which entered the graveyard opposite the old vestry door by what was known as "Mr. Patten's green gate." He married Rebecca Higginson, and had one son, James, who was an officer in the Brookhill Yeomanry Corps of Infantry. His grandson, James Patten, M.B., LL.D., was one of the early inspectors of National Schools. He died at Streamville in 1869, and bequeathed a legacy of £3,122 for the poor, sick, and infirm of Magheragall. Rev. Francis Patten wrote an account of the parish for Mason's Parochial Survey in 1813, which is not in the published volumes of that work. In it he says, "I have possessed the parish for 35 years, and 45 years in the Church." It does not yet appear where his previous ten years of ministry were spent, but it is curious that he signed the Easter Vestry minutes of 1772, 1775, and 1777 before he became vicar. He also writes of the education of the children as follows:-- "There is no endowed school, but three schoolhouses, built by private subscription, and other ones held in barns in summer by masters at very small salaries, and scholars very numerous, especially in a Sunday school lately encouraged in the parish, which, I think, is attended with good effects, as it keeps the young people of the community out of mischief, which generally follows from idleness." To this latter there is a reference in the minutes of the Easter Vestry of 1812 -- "To George Greer, for keeping a Sunday school, £2 5s 6d." Elsewhere he mentions "a good house belonging to Mr. John Sedgefield, near the church, where his son-in-law, Rev. Skeffington Thomson, keeps a good classick school." This house, a fine one, said to have been built in the time of Cromwell, stood on the site of Brookmount, now the residence of Mr. R. G. Hill. Rev. Francis Patten died in 1825, aged 80 years. Rev. John Mussen, M.A. -- 1825. He was also a Scholar of T.C.D., 1819, and must have been a curate in the South of Ireland, as he was ordained priest at Cloyne in 1825. He was a relative of Dr. Mussen, of Glenavy, was married to Henrietta Garrett, of Magheragall, and lived in the cottage which formerly stood on the site of the new graveyard. During his time the present church was built in 1831. From Magheragall he removed to the parish of Kilmore, Co. Down, in 1846, where he died in 1866, aged 68. He was a diligent worker, especially among the children, and is said to have instituted daily services at Kilmore, which were not appreciated by the people. He was buried within a railing in the north-west part of the graveyard, close to the railing round his predecessor's grave, but in neither case is there any inscription. Rev. David Carlisle Courtenay, M.A. -- 1846. He was ordained in 1824, in which year he appears as minister of Ballycastle, Co. Antrim, and became perpetual curate of Ballyeaston in 1827, from which he came to Magheragall. He was appointed rector of Tickmacrevan or Glenarm in 1851, which he held till 1872. Mr. Courtenay lived in Castle Street, Lisburn, and had as curate Rev. Robert Mussen, who is said to have been the first curate of the late Primate Alexander. Mr. Courtenay, whose wife was the sister of Lord Chancellor Brady, got the standing of the incumbent altered from that of vicar to that of rector. A note in the minute book reads thus: "It is here recorded that after the demise of Bishop Many, of this diocese, in Oct. 1848, a memorial was presented to the the Privy Council in Dublin by the vicar, D. C. Courtenay, representing the very small income of the parish, and praying that the rectorial rent might be separated from the Episcopal revenues, to which the Privy Council granted a favourable reply, constituting the parish into a separate and distinct rectory, so that the vicar henceforth becomes the rector, to whom is now payable the rent of rectorial lease made by the late Bishop and renewed in 1847 to Thos. Johnson, Esq., of Ballymacash, and at the termination of this lease the entire rent charge, rectorial and vicarial, will become payable to the future incumbent." But the Disestablishment and Disendowment Act changed all these happy prospects for the rectors of Magheragall! John Gibbs, M.A. -- 1851. The following notes were found among the papers of an old parishioner, Isaac Greer -- "1851, Sept. 7. Mr. Gibs' first service in the church," and 1852, May 16. 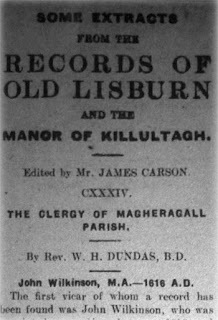 Mr. Falloon preached his first sermon in Magheragall; his text was from Matthew 22 ch. 42 v., 'What think ye of Christ?'" It would appear then that Mr Gibbs was in the position of minister for a few months, but his name does not appear in the vestry book. He was ordained in 1835, and became rector of Hillsborough in 1869; he was also Archdeacon of Down. He had been curate of Annahilt in 1826, and, after a short stay at Magheragall, was appointed rector of Ballynure in 1852, where he died in 1872 aged 74 years. There is a tombstone to his memory at Ballynure, and also a mural tablet erected by his daughter. Maurice M'Kay, LL.D. -- 1853. Rev. M. M'Kay was a Scholar of T.C.D. 1824, LL.D. 1835, and had been engaged in educational work before his appointment to Magheragall. He was master of Carrickmacross Grammar School from 1834 to 1841, of Drogheda Grammar School from 1841 to 1850, and edited some Orations of Cicero for use in schools. During his incumbency the present rectory was built about 1856; there had previously been no residence provided for the minister. Dr. M'Kay was naturally anxious to improve the position of education in Magheragall, and he put the parochial school under the National Board. But this action was greatly disliked by the people, and raised such a storm of opposition that it had to he removed from the list of National Schools, and many years elapsed before it was again put under the National Board. He had two sons, Rev. Maurice Knox M'Kay, incumbent of St. Matthew's, Broomhedge, at whose house in Blaris he died in 1871; and Rev. Charles Elrington M'Kay, rector of Inver, Co. Donegal. Edward Mockler, B.A. -- 1863. Rev. Edward Mockler graduated in T.C.D. in 1836. His grandfather had been Archdeacon of Cloyne. 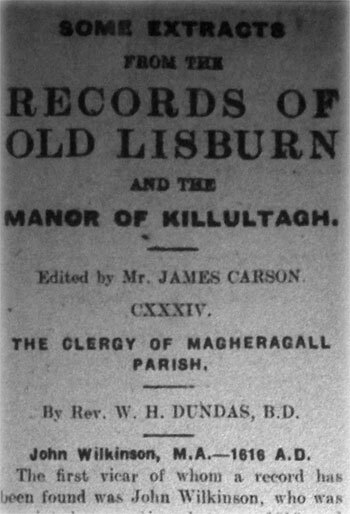 Before coming to Magheragall he had been curate in Ballinderry in 1839, in Skerry and Rathcavan (1840), and in Killead from 1841. After 31 years of ministry he resigned the parish in 1894, and died on 10th October, 1894, aged 82 years. He also is buried in the N.-W. portion of the churchyard, where a monument is erected. There it also a mural tablet in the church. Robert Walker, LL.D -- 1894. William H. Dundas, B.D. -- 1907.
who had been a Scholar of T.C.D. (y894),[sic] like six of his predecessors in the paris, and was ordained in 1898 for the curacy of St. Thomas', Belfast. He is the author of various articles in Hastings' "Dictionary of Christ and the Gospels," and "Dictionary of the Apostolic Church," also of "Enniskillen -- Parish and Town." John Wilkinson, M.A -- 1616 A.D. The first vicar of whom a record has been found was John Wilkinson, who was appointed some time between 1616 and 1618. He was also vicar of Llanavye (Glenavy), which was then united with Magheragall. In 1622 the church was described as a ruin; he was resident, and served the cure. A John Wilkinson, possibly the same, was the vicar of Annaduff, in Ardagh Diocese, from 1634 to 1661, prebendary of Oran (Elphin) 1636-1669 and rector of Sligo in 1666. Meredith Gwilliams (or Gwyilyms), M.A. 1623. He, too, was vicar of Glenavy at the same time, and also of Ballinderry, a fairly large union of parishes! to which he was presented by Sir Ffulke Conway. He was, like many of his successors, a Scholar of T.C.D., was ordained by the Archbishop of Armagh in 1617, and had been rector of Baronstown and prebendary of Keene, in Co. Louth, before coming to Magheragall. In 1625 he was appointed by Edward Lord Chichester as his domestic chaplain. 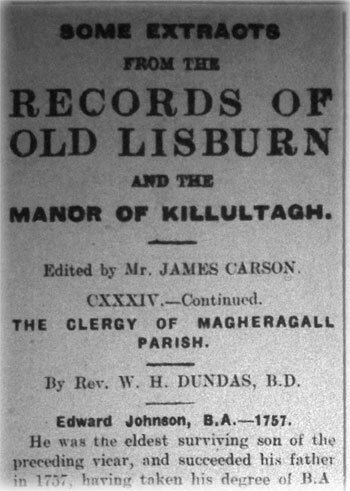 He and other clergy in Killultagh seem to have had difficulties in getting their tithes. In 1634 Jenkin Conway writes that he is "in difficulties with the resident clergy about tithes. They are complaining to the Bishop." He hopes Lord Conway will support him by speaking to the Bishop. In 1635 one Hartwell writes to Rawdon, "The parson Gwilliams has got a process against those who keep the tithes from him"; and in 1636, "Parson Gwilliams has left Dublin with an order from the Deputy to receive the tithes in kind." In another letter of 1636 one Robert Ward says "he entertained old fat Parson Piers on the way up from Drogheda, and by talking to him and giving him wine found out that he and his son Gwilliams were going to try and recover a glebe held by Lord Conway." Gwilliams evidently made a fine fight for the interests of the Thomas Piers, whom Ward speaks of so contemptuously, was instituted vicar of Derriaghy and Annagallanogh (Aghagallon) in 1635. William Chambers was appointed in 1635; at the Visitation of 1633 Chambers (no Christian name) is returned as curate of Lisnagarvy. The church at Lisnegarvy appears in those days to have been distinct from Blaris, as at the Visitation of 1661 Michael Mathews was curate of the church of Lisnegarvy, while Jerem Piddocke, archdeacon, was rector of Blaris. In the State Papers there is an undated letter of the time of Charles I. from Wm. Chambers to Rawdon concerning a post or "conveniency" which the writer wants in Ireland. He discusses payment to be made for something he had bought from Rawdon, and protests his loyalty to Lord Conway, and he concludes with the curious postscript, "Mr. Tandy's flame is quenched." No doubt he is the Mr. Tandy of the postscript referred to. He was appointed in 1637, and also became vicar of Glenavy in 1638. Probably he also held both parishes together. The right of nominating the vicars was still exercised by Lord Conway, through Rawdon, his agent, and it had been his intention to appoint another minister. In April, 1638 he writes: "I put Mr. Lawmouth into the parishes of Camlin and Glenavy, but he soon showed himself a true Scotchman, and began to wrangle about terms, so I presented someone else. The Lord Primate interfered, but I think we shall have our way." Further interesting particulars about Philip Tandy will be found in Nos. XCVI. and CXXXI. 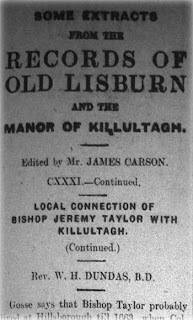 of this series of "Extracts from the Records of Lisburn and the Manor of Killultagh." He was not in actual possession of Magheragall during the Commonwealth, as appears from the inquisition held at Antrim in 1657, which says: "The parish is now claimed and possessed by the Bishop of Down. Of late Mr. Moore, a preaching minister in salary, hath supplied the same." The church was in ruins near the border of the south side of the parish -- no glebe -- and "since 1650 that the parish began to plant (i.e., to be supplied with ministers not of the Church of Ireland) Mr. Weeke, who preached in Lisnegarvy, had by order received the tithes until these two last years that Mr. Gellis, a preaching minister, supplied the core thereof, and received the vicarial tithes and George Rawdon. Esq., the rectorial tithes, having a lease yet in being of the same from the said Bishop and Chapter." These were all Independent or Cromwellian ministers, and during this period the services of the Church of Ireland were prohibited and suspended. It appears from letters of 1664 (State Papers, Ireland) that Tandy was then acting as agent in some matters for Lord Conway. His wife was a sister of Sir George Rawdon, as stated in Archdall's Lodge's Peerage (1789) where, however, her name seems wrongly given as Elizabeth. Mrs. Mercy Tandy was buried on December 10th, 1708, aged 85. At the Visitation of 1664 Alexander M'Whidd appeared, and showed his title as "curate" (or vicar) of Magheragall. At the Visitation of 1679 he was still "curate," and "is expected at Dromore, where he will appear." This reference to Dromore is important, as it makes it practically certain that he is the Alexander M'Whidd who was vicar of Drumballyroney in 1674. An interesting certificate and letter of his are printed among the Hamilton papers in the Ulster Journal of Archæology, Old Series, Vol. III., p. 144. The certificate refers to a gift of six acres about the year 1632 by James Lord Viscount Clandeboye to John Boile, the reverend minister of Killyleagh, for his own and his daughter's lifetime, in exchange for some lands lying near the old church. He says: "I, being reader to Mr. John Boile. . . . This lease among his books and other papers I had charge of for the space of seven years in his house, where I waited on him, being his servant." In the letter to Jane Boal he says: "Preserve this certificate and take advice from surest friends, and may the God that commands to judge the fatherless and pleads for the widow assist you and help you in need. So wisheth your well-wisher and friend to his power." With the best will in the world, Rev. Alexander M'Whidd could not adequately perform the duties in Drumballyroney (Rathfriland) and Magheragall at the same time. The care of Magheragall must largely have fallen to the clergy of Lisburn, judging by the number of baptisms from Magheragall recorded in the register of the Cathedral. Between 1665 and 1692 there were no less than 53 baptisms. A new church was probably built in his time, as the bell bears the date 1676. John Leathes, M.A. -- About 1693. At the Visitation of 1693 the Lord Bishop was returned as rector of Ardquin and Lambeg, where there were no "curates," and of Magheragall, where John Leathes was "curate." An order was made that "curates" should be placed in these three parishes, "especially in Magheragall." The Bishop was Thomas Hacket, an Englishman, appointed in 1672, who had been for twenty years notoriously negligent of his pastoral office, and for the most part resided in England. In 1694 he was deprived of his office. John Leathes belonged to a family which is very prominent in the early history of Belfast, where several of the name were Sovereigns (a title corresponding to that of Lord Mayor). He was the son of Thomas Leathes, of Co. Down, and was a Scholar of T.C.D. in 1685, M.A. 1691. He became curate of Derry, and was appointed Rector of Tamlaght Ard (Magilligan) in in 1702, which he resigned shortly before his death in 1737, aged 70 years. A mural tablet which was erected in the old Hillsborough Church, and is now behind the pulpit in the present church, speaks of him in the highest terms as "Exemplary for every virtue which can recommend a clergyman; every grace which can adorn a Christian. . . ." It continues: "Having never wronged any man he needed not to restore fourfold. But he really did bequeath half of his Goods to the Poor at his Death, to whom he had constantly given a fourth Part of his yearly Income in his life. Where the good man's heart always was there he laid up his Treasure also. Daniel Mussenden, of Belfast, Merchant, erected this Monument to preserve the Memory and Example of his Friend. Reader, live the life of this Righteous man, and thy last and shall be, like his -- Peace." Edward Goldsmith, D.D. -- 1684. This vicar was probably a cousin of the poet, Oliver Goldsmith. He was the son of George Goldsmith, and was a Scholar of T.C.D. 1680, D.D. 1699. 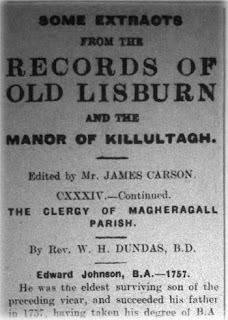 He was ordained deacon in the church of Kilcock, Diocese Kildare, in 1682. He was appointed prebendary of Rasharkin in 1692 and vicar of Magheragall in 1694. 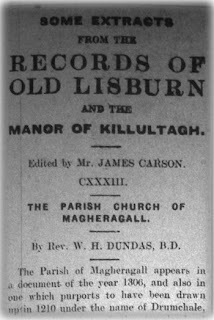 The Diocesan Register gives a full account of his induction into real actual and corporal possession of Magheragall on May 6th by Rev. Jos. Wilkins, rector of Lisburn. Among those present were James Hamilton and John Clarke, churchwardens; Godfrey Walker, Edward Aynesworth, George Walker, Thos. Tomson, John Hadock, Isaiah Hadock, and Wm. Watson, parish clerk. He signed the following declaration: "I do declare that it is not lawful upon any pretence whatsoever to take arms against the King and Queen (William and Mary), and that I do abhor that trayterous position of taking arms by their authority against their persons or those that are commissioned by them, and that I will conform to the Liturgy of the Church of Ireland as by law established." In 1700 he become Dean of Elphin, and died in 1722 or 1723. George Thompson, B.A. -- 1706. He was a son of George Thompson, born in Co. Down, and educated at Lisburn by Mr. Harvey. He entered T.C.D. as a sizar in 1686, aged 19, and graduated B.A. in 1691. Robert Christian -- Before 1728. The name of this vicar, like that of two of his successors, Reynett (de Reynet) and Fletcher (de la Flechere) is of French Huguenot origin. According to Gimlette the name Gwilliams is also of Huguenot origin. The name of this vicar does not appear on the books of T.C.D., nor is it known in what year he was appointed to Magheragall. He was certainly vicar in 1728, when he inducted John Smyth, M.A., into the parishes of Donegore and Killead. He seems to have been a clergyman of some local importance, for he also inducted Anthony Welsh into Ballinderry in 1730 "by delivering to him "wood, iron, and stone," and John Welsh into Magheramesk and Aghagallon, and Edward Higginson into Killead in the same year. Local tradition states that Robert Christian lived opposite the church, on the lower side of the railway, in the house called Christian Hall, which is now known as Poplar Vale, the residence of Mr. R. Campbell. He married Huldah Leashes in 1695, and his son, Stanley Christian, succeeded him in Christian Hall. From his daughter Eleanor, the late Isaac Greer, of Moneybroom, was descended. Thomas Johnson, B.A. -- 1742. The next three vicars were connected with the Johnson family so long associated with Ballymacash, where the residence was built a few years after the Battle of the Boyne. Thomas Johnson was son of John Johnson. He was born in 1700 in the city of Waterford. He was a Scholar of T.C.D. 1721, B.A. 1722, and appears as curate of Lisburn in 1740. His wife Mary was the daughter of Ralph Smyth, of Lisburn. One of his sons was the Rev. Philip Johnson, of Ballymacash, who died in 1833 after having been vicar of Derriaghy for 61 years. A family record states that Rev. Thomas Johnson died on Sunday, 27th October, 1757, in the 58th year of his age, and on Tuesday morning following was carried from his house in Lisburn to the Parish Church of Magheragall, and there interred in the aisle of said church opposite the pulpit. THE PARISH CHURCH OF MAGHERAGALL. The Parish of Magheragall appears in a document of the year 1306, and also in one which purports to have been drawn up in 1210 under the name of Drumchale, which is like that of the townland of Drumsill or Drumcill, though it is not known at present whether there is any connection between them. It is spoken of as a "part of the endowments bestowed on the Bishop by an ancient chief named "Engusa MacMailraba" (O'Laverty's Down and Connor). This arrangement continued until 1848, the Bishop receiving the rectorial tithes, the incumbent being his vicar. 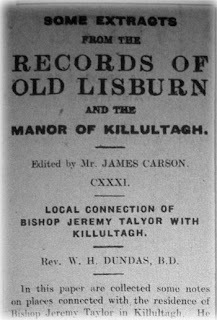 On the death of Bishop Mant in that year the parish became a separate and distinct rectory, and the rent of the rectorial lease renewed in 1847 to Thomas Johnston, Esq., of Ballymacash, became payable to the rector, who at the termination of the lease was to receive the entire rent charge, rectorial and vicarial. The Church Act of 1870, of course, took away all this endowment. of which there is any trace was in the townland of Ballyclough, at Mr. Davidson's, on a mount beside the road leading to the Horsepark. The remains of it consist of a portion of the north wall, about fifteen feet and three feet eight inches thick, which has long formed a side wall of an outhouse. To the north of it is a field in which bones were found, evidently the graveyard. The following information about this church and the vicinity is taken from O'Laverty's Down and Connor:-- "A cineary urn was found in the site of the graveyard, which proves that the church occupied a site which had been sacred in the times of paganism. There formerly stood in the graveyard a round tower of considerable height (as also Trummery); it was taken down in the year 1790 by Mr. Redmond (? Redman), who used the stones in the erection of Springfield (old) house. In Brookmount (? Brookhill) demesne there is a great funereal mound such as is to be found near many of our ancient churches. The ancient Holy Well, which is now called the Boiling Well, is between the site of the church and the mound. It was called in the memory of old people. Sunday Well, which is the ordinary popular translation of Tubber Doney (Dromhnach—Sunday). On the opposite side of the road from the funereal mound there are several large stones, which are said to indicate a giant's grave. On ploughing the ground near these in 1837 several urns were found, which contained human bones." If the above is true about the destruction of the Round Tower it is another example of that wanton carelessness which has swept away so many interesting monuments of ancient times. The Boiling Well has long ceased to deserve its name, as its feeders have been tapped by a pipe,, and the water is now brought to the side of the road. This church is described as a ruin in the Visitation of 1622; it had been allowed to decay or had been wilfully damaged in the troubled times of Elizabeth and James I. In this it was no exception, for the same document, out of 126 churches in Down and Connor, describes about 110 as in a state of decay or ruin. Probably it was repaired when the parish was planted with English and Welsh settlers. Soon came the Rebellion of 1641, followed by the Commonwealth and Cromwell. Under his rule the worship of the Church of Ireland was prohibited, and the use of the Book of Common Prayer was punished by severe penalties. If the Restoration of Charles II. had not changed the aspect of affairs the parish of Magheragall would have completely disappeared, according to a scheme set on foot for re-arranging parishes by uniting and dividing them, the purpose being that the ministers introduced might have a salary of £100 or £80 (the income of Magheragall was then £10 a year), yet that no part should be above three miles from the church. Cromwell's ministers were to be well provided for, since, according to Reid's History of Presbyterianism, these sums must be multiplied by ten to get their present value. An inquisition was held at Antrim in 1657 to arrange how this might be carried out, and among the recommendations of the Commissioners was the following -- that part of Magheragall Parish be added to Lisnagarvey (Lisburn), viz. : "two towns on the east side of the little brook that descends from the Lymekill, and the town of Magheragall by the mill there, the boundary to run between Edendrumsilla and Mullicarton to Lurganure, Broaghmore, and the brook at the bruan hedge, an so to the Lagan river." The remainder was to form part of a new parish called Lackey, for which a new church was to be built at that place to serve for Aghalee, Aghagallon, the Choppellry of Maremeske, also the towns of Brookhill, Mullaghcarton, Magheresmiske, Morruske, and Bonalargy. Brookhill is not a townland, but the lease of it in 1649 included the townlands in the upper part of the parish. The Lackey is marked on the map as on the road from Megaberry corner to Ballinderry. Happily this proposal was not carried out, as the Church of Ireland resumed her rightful position at the Restoration in 1660. Skull and Crossbones, Coffin, Hourglass. OF . JULY . 1687. Soon after Rev. Francis Patten became vicar a subscription list was opened in 1780 for slating and repairing the church, which amounted to about £40; the vestry book contains the names of all the subscribers. But the building was evidently in a bad state, and was a source of continual expense, as the annual Easter accounts show. In the beginning of the nineteenth century the parish shared in the increase of population which was general throughout Ireland, and a necessity arose for supplying more accommodation for the parishioners, who, in 1834, numbered 2,184 members of the Church of Ireland out of a total population of 3,191. Accordingly, in 1826, the vestry enacted that "forums" be provided at a cost of £1 10s, and in 1828 the sum of £50 was assessed for improvements of the church. At first the proposal was to build a new aisle, and for this another £50 was assessed in 1829, but in 1830 the larger scheme of a new church was taken up. The Board of First-fruits granted a loan of £1,000 for the purpose, and at a vestry held on the 11th of January of that year "the majority of the parishioners agreed to assess themselves at the rate of £40 per annum for a period of twenty-five years in order to repay the loan, which was evidently given free of interest." Towards this Lord Hertford consented to give £20 the first year, and said that he would probably continue to do the same, but would not bind himself, still less his successors. No mention is made of these instalments after 1833. It may be presumed that the same arrangement was continued until the loan was paid off. On the same day a committee was appointed for conducting the building, consisting of -- James Watson, Esq. ; Captain Houghton, Messrs. Patterson, Dickey, Garrett, Jas. Greer, Alfred Gill, William Gill, Val Gill, Higgins, C. Greer, Fisher, James Meharg, Cinnamond, Thomas Hall, and Rev. John Mussen. Q. B. F. Q. S.
James Watson, Esq., of Brookhill, laid the first stone of this sacred building on June 25th 1830, whose grandfather's many gifts conferred upon the Church can still be seen or heard of in conversation. At that time George IV. was in the eleventh year of his reign, and was suffering from a severe and fatal disease. The Very Rev. Richard Mant, D.D., was most worthily occupying the Episcopal See, and was remarkably adorning it by his character, piety, watchfulness, and learning. He was a vigorous defender of this Anglican Church, and constantly preserved its ancient prescribed laws, both by his authority and example. But he has left a perpetual memorial of himself in his books, which will be always carefully preserved in the shrine of the Christian temple among the most renowned of the sons of the Reformed Church. He also perpetuated the memory of his care for the diffusion of true religion throughout his diocese in the very many churches which were erected and consecrated by his help. Ye who may afterwards dig up the foundations now laid, see that the cause of piety be not injured by negligence or profane hand and that these walls be not removed for any other cause than they be rebuilt wider, at least not more narrow. The most noble Marquis of Hertford promised that he would probably contribute half the expense, which is estimated at a total of £1,000 British. Some memoranda were also written on the back of the parchment, viz. :-- The south wall of the new church stands in the aisle of the old. The aisle of the old church was found to be full of coffins of black oak. A coin of Queen Elizabeth, perhaps a groat, dated 1572, was found nearly under the place where the communion table formerly stood. The architect of the Board of First-fruits, who superintended the building of the new church, was William Farrill, Esq. The contractor who built it was Mr. Paul M'Henry of Lisburn. The new church will be eight feet wider than the old one, and nearly as long. The inscription over the doorway of the new Church bears the cypher adopted by the Roman Emperor, Constantine, for the shields of his soldiers after his conversion to the Christian religion, 312 A.D. This cypher (XP) together with the letters on each side of it (Alpha and Omega) was used by his son Constantius as an impression for his coins. As they express the fundamental principle of Christianity they were judged not improper for the purpose to which they are now applied (XP are the first two letters of the Greek word Christ). The motto from St. John's Epistle, "This is the victory that overcometh the world, even our faith," was chosen in preference to that warfare under Christ's banner to which we are enlisted in our baptism -- and the ultimate triumph of His soldiers under the shield of Faith -- "Who is he that overcometh the world but he that beliveth that Jesus is the Son of God?" The new church was consecrated by Dr. Richard Mant, Bishop of Down and Connor, on Thursday, the second day of June, 1831. We should be very grateful to Mr. Mussen for having made such a careful record. We have as links with the old church the bell, the communion plate, the font (which is probably that referred to in the minutes of 1771, when 10s was assessed for a new pillar and a new bason for the font), and perhaps the old copper "Shovels." The communion plate is of Irish marked silver, and consists of a chalice (inscribed Magheragall 1705), a flagon and two patens, each of which bears the inscription, "Given by Mr. Watson of Brookhill, to Magheragall Parish, Anno Dom. 1796. A second chalice is now being presented, which is an exact copy of the one in use for 206 years. It is interesting to compare the list of seatholders in 1831 with that of the present day, and to note what changes had taken place in the last eighty years. There were then thirty-two pews in the body of the church, the first on each side being square, and eleven (with, I suppose, one for the choir) in the gallery. There are now thirty-six below and twelve on the gallery, these latter being unappropriated. James Watson, of Brookhill, occupied the first seat on the right aisle, and Captain Houghton, of Springfield, the second; the third was assigned to Miss Sarah Patten (daughter of Rev. Francis Patten, who was vicar 1778-1825). Captain Crawford, of Red Hill (or Lissue), was given a seat in the gallery "as a matter of grace," he not being resident in the parish, on condition of giving it up if the accommodation of the inhabitants required it. The list of 1831 was altered from time to time in the years immediately following; taking it as it stands corrected, it contains the following names, which still appear in our list of subscribers (though not always representing the same families):-- Watson, Mackey, Balmer, Campbell, Quinn, Murphy, M'Court, Hill, Lackey, Greer, Higginson, Garrett, Branagh, Hall, Euert, Clarke, Rollins, Law, Anderson, Fletcher, Gill, M'Knight, Johnston, Martin, Thompson, Thomson (of Horsepark), Culbert, Kelly, M'Cluskey, Gordon, Blythe, Abbott, Lorimer, Brown, Stewart, Harrison, Stuart, Spence, Connor, M'Bride, Patterson, Buntin, Weir, Burns, Tolerton, and Taylor. An organ was provided in 1875, and smaller repairs and improvements were effected from time to time. In 1887 portions of the townlands of Ballyclough and Ballinadolly and the whole of Aughacanan were given to form part of the new Parish of Stoneyford. The new chancel and graveyard were consecrated in 1898, and in March, 1906, the church was reopened after the complete renovation of the interior at a cost of about £500; in the same year the church clock was erected by Mrs. Richardson and family in memory of the late Mr. Joseph Richardson, of Springfield. The portion of the cost of the renovation, which led as a debt, was paid off in 1911, nan nothing is now wanting in the furnishing of the church for the seemly worship of God. Gosse says that Bishop Taylor probably lived at Hillsborough till 1663, when Col. Arthur Hill died. He is said to have occupied, and even to have built, a house in Castle Street, Lisburn, opposite to the entrance to the Cathedral. Canon Lett discovered that Homra House, near Lisburn, belonged to him, and that in the latter part of his life he often resided there (Gosse, Jeremy Taylor). The author of the Concise History of Lisburn (1906) says that Lord Conway fitted up for the Bishop at Magheraleave, a charming residence. The cottage is still to be seen, and the study in which he composed some of his later works. It is situate near "Duncan's Dam," off the Magheraleave Road, and is now occupied by a Mr. Beckett. In the Ulster Journal of Archæology New Series, Vols. III. and VIII., there are full articles on the buildings associated with Jeremy Taylor by Mr. Bigger and Mr. Fennell. Portmore Castle was a magnificent house, erected in 1664 by Earl Conway, after plans of Inigo Jones, on the site of an old castle of the O'Neills. It was certainly not completed at the time of Jeremy Taylor's residence if the date be correct. The stables (140 feet by 35 by 40) had accommodation for two troops of horse; water was supplied by pumps to a series of marble cisterns.When the Lords Conway became extinct its glories departed. The Castle was dismantled about 1761 and the material sold. The remains consist at present of a parcel or two of brickwork, and the wall enclosing the bowling green. The great oak of Portmore was blown down in 1760. Its circumference was 14 yards, and it measured 25 feet to the first branch. The Deer Park, to the north of the lough, contained about 2,000 acres (Mr. Bigger says 1,000). Sallagh Island lies close below, surrounded by marshy land. It is entered at present by walking along the trunk of a fallen tree; here tradition says that Dr. Taylor had his study. The remains of the old Church of Ballinderry are situated to the south of the Castle, which at present can only be reached from it by the lane past the mill. These ruins consist of two gables 63 feet apart and 29 feet wide. There is a window in the east gable, five feet by fifteen inches, with moulded top, and splayed inwards. This is given from notes by Canon Lett, but it is now completely hidden by the ivy. The graveyard (sometimes called Laloo) appears like an island in a bog, surrounded by a fosse and a double hedge. In it are to be seen two rude basins hollowed out of boulder stones. This was without doubt the "half-ruined Church Of Kilulta," in which Dr. Taylor is said to have often preached to a small congregation of loyalists during the Commonwealth period, and where no doubt he used the Book of Common Prayer when it was forbidden by law. 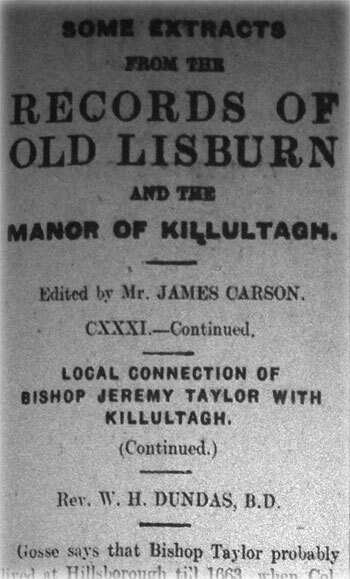 By Kiltulltagh is not meant a parish, but the manor or territory of that name. There is a townland of Derrykillultagh near the old churchyard of Templecormac to the east of the road from Magheragall to Ballinderry, which old church some have thought to be the place referred to, but a view of Portmore Castle and Portmore Church is sufficient to decide the matter. That Kilulta was used in a loose way for Ballinderry appears from a letter of Rawdon in 1666:-- "We want a a new minister in place of Mr. Evans, removed out of Kilulta." George Evans was admitted Vicar of Ballinderry in 1661. David Hardy, a Commonwealth minister, was in possession of Ballinderry Parish from 25th June, 1658, at a salary of £80. Bishop Taylor wished to remove the church to a more convenient site, and accordingly arranged for the building of what is called "The Middle Church." It was not ready for consecration until 1668, a year after his death. It had a narrow escape in 1823 when it was agreed to build a new church on this site; however, this was subsequently annulled after much discussion, "the question being three times put" (Vestry Book), and the new church was built more to the east. By the end of the nineteenth century the Middle Church had fallen into a bad state, and the ivy threatening to destroy it. But it was restored in 1902 by Mrs. Walkington at great expense in memory of her husband, Mr. Samuel Walkington, of Oatlands, Ballinderry. The architect was Mr. Fennell, who followed the old lines exactly, and added no new feature to the building. The old oak roof was believed to have been brought from the old church by the lough, and it had to be replaced by a new one. It consisted, like the present one, of oak rafters four inches by four inches, framed and trussed together and held with strong oak pins. The trusses are two feet apart. In earlier times it had been covered with shingles instead of slates; the present slates are new, as the old ones could not be made watertight. Here, then, can be seen a country church just as it was two and a have centuries ago, with its circular-headed mullioned windows, its old "three-decker" (pulpit, reading-desk, and clerk's desk) placed on the side of the church, its high, uncomfortable pews with no fixed seats, but only forms, which could bo sup, II plied according to the number required. A space at the west end was left unpewed, for general use, as was customary in old churches. The two front pews are larger than the rest; tradition says that the one opposite the pulpit was Lord Conway's pew. Before the restoration most of the doors had been removed; one still remains, with the carving, A.B. 1668 A.H. This was the date of consecration, and the initials may be those of the first churchwardens. It is probable that some of the fittings may also have been brought from the old church. No provision was made for heating in winter. A plan given by Mr. Bigger shows the vestry as extending from the north side behind the pulpit, and the position of the old door on the south side. He thinks the church was at some period lengthened by nine feet, when the gallery, with stairs leading to it from outside, was added. From the roof of the Middle Church, over the east window, the two irons still remain from which hung the "Royal Arms," which were removed in 1859 and placed on the west gallery of the modern church. They show the lion and unicorn, etc., complete as represented during all the Stuart period, and the Royal monogram C.R. They may have been erected at the instance of the garrison in Lord Conway's Castle when it flourished in all its glory. They are painted on a heavy oak panel, with deep oak moulded frame, and weigh 2 to 2½ cwt. The old oak communion table is still preserved, and an oak chest (4ft. by 1ft. 5in x 1ft. 5in.) divided into three compartments, the centre having a slit for coins in the lid, and the date 1706. The Middle Church has also an old font, which consists of a circular stone basin on a pedestal of one solid piece of oak, with a cover of oak. One new thing alone has been added -- a funeral hatchment of Bishop Taylor, suspended on the south wall, his arms being impaled with those of the diocese. Bishop Taylor is locally believed to have wished to be buried in this church, and that a grave was prepared for him. It is said that his will contained a provision that he should be buried here "in case it should be consecrated before his death"; but it was not to be. On his deathbed he said, "Bury me in Dromore," and there, in 1667, he was buried in the vault beneath the chancel. The Middle Church of Ballinderry was not consecrated until 1668. Yet in this church before the restoration there was a depression before the communion table about the length of a coffin, which an old woman used to point out as Jeremy Taylor's grave, and said she knew it because she saw his shin bone! On August 14th Rawdon wrote from Lisburn:-- "The Bishop of Down died about 3 yesterday afternoon. His Lordship desired to be buried in the church he built at Dromore, or at Ballinderry if it should be consecrated before his death," but it is not so. And on August 31st he says:-- "The news about removing trees at Portmore House a mistake. . . The good lady has asked me to put one of your servants into the house to preserve it, for the very night the Bishop died the orchard was broken into and the fruit all taken. . ."
"The funeral is to be on Tuesday, and the body was sent in my old coach to Dromore Church." Where to find this side of hell?" Mary Harrison, a daughter of Edward Harrison and Joanna Taylor, was married to Col. Francis Columbyne, and through her Mr. George H. Clarke, J.P., of Rosevale, Lisburn, is connected with Bishop Taylor. 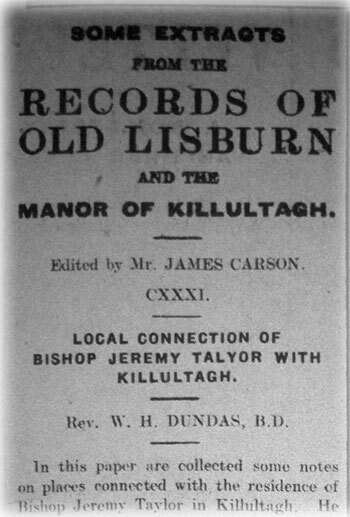 In this paper are collected some notes on places connected with the residence of Bishop Jeremy Taylor in Killultagh. He was born in Cambridge probably in 1613, in which year he was baptised. Having graduated at the University of Cambridge, he became Rector of Uppingham in 1638. During the Civil War he took the King's side and was expelled from his rectory, a "preacher" being put in his place. He was prisoner of the Parliament in 1645, and afterwards found refuge with the Earl of Carbery at Golden Grove, in South Wales, where, with two friends, he conducted a school. In 1658 Lord Conway, the third Viscount and first Earl of the name, was anxious to strengthen the influence of the Anglican Church in his Manor of Killultagh, which included the parishes of Blaris (or Lisburn), Magheragall, Ballinderry, Aghalee, Aghagallon, Magheramesk, and Glenavy. At that time the Episcopal clergy had been dispossessed, and an Independent -- Andrew Wyke (or Weeke) -- was in possession of Blaris, having been appointed by the Commonwealth in 1651. Conway, by the advice of Evelyn, invited Dr. Taylor to come over, and offered him the post of assistant lecturer at Lisburn. Taylor, however, was not willing to come; he was not attracted by the prospect of lecturing under Wyke, and the stipend was very small. Further, the trouble and expense of moving his family to Ireland would be considerable. He also had a very unfavourable report of the social conditions of this part of Ireland from Major George Rawdon, Lord Conway's brother-in-law, who commanded the garrison at Lisburn. However, Conway was not to be refused, and at last Dr. Taylor consented to come. The Calendar of State Papers gives some interesting letters in this connection. On April 2nd, 1658, Major Rawdon wrote to Lord Conway from Carrickfergus: -- "On 23rd ministers of these parts are appointed to attend at Dublin to be placed and receive their maintenance in tithes and not by salaries; but I hope it is only where the Commonwealth hath the patronage. I am told that you have assured Dr. Taylor £200 a year for his own life and his children's. You should not be mistaken in your expectations. Captain Roma's part of Ballinderry and Portmore yields now only £22 10s at 2s 6d per acre; if let at 4s an acre, as rest is, it would amount to no more than £36 a year. The cess is paid by your Lordship for those tenants that pay 4s. Sam Dawson and four English farmers have the rest of the lands of Ballinderry in leases for 41 years. The tithes do not come to above £80 a year." Preparations were being made for his comfort at Portmore Castle, where he was to reside, for on May 26th Rawdon wrote from Dublin:-- "I have had the ill way paved from the mill at Ballinderry to the house that Dr. Taylor may pass the winter." He also says:-- "I have withheld the tithes of Lisnagarvy from Dr. Wyke, and took the land from him, and petitioned the tithes might go towards building a free school at Lisnagarvy. He went up with the 3rd Chief Baron . . . but prevailed not and now does not make account he can stay at Lisnagarvy." On June 2nd he wrote:-- "The idea of Dr. Taylor coming over is much disliked by all the ministers in their assembly here lately. At dinner on Saturday at Chappellizard Dr. Hamilton, who sat next me, told me what offence it would give. There is great crossness among the ministers, but they are all agreed in this. If, therefore, he comes, he must he well provided with His Highness' pass or some other, that he be not subject to the trouble of petulant spirits. The ministers are now settling to receive their tithes themselves and not salaries." The Lord Protector was induced to give him a pass, and a protection for himself and his family, and Conway helped turn to acquire a farm of 40 acres at Magheralin "at great advantage." Before the end of the summer of 1658 he removed to Portmore, from which probably once a week he went to Lisburn to give his lecture. He also occasionally visited Hillsborough. Rawdon writes from that place on October 15th, 1658:-- "Dr. Taylor preached excellently this morning. Dr. Tandy is also considered a rare preacher, and is liked in the parish." Tandy was destined to give Dr. Taylor trouble in the near future. He was, I believe, the Philip Tandy who was instituted as Vicar of Magheragall in 1638, and also of Glenavy in the following year, just as John Wilkinson was admitted Vicar of Magheragall and Glenavy about 1616-18, and Meredith Gwilliams Vicar of these two parishes, with Ballinderry also, in 1623. Tandy had previously held the position of schoolmaster in Lisburn, and also of agent or librarian to Lord Conway. In 1635 he wrote to Rawdon: -- "I am setting Lord Conway's books in alphabetical order, and give all the time to them that I can spare from my school. I classify them also by volumes and sciences. In the Christmas holidays I unchested the chested books and put then into the drawing-room, where they often aired by good fires. I lately tried to have an usher, but my school is not large enough to maintain one." In a letter of 1636 he says he is sending some books which Major Rawdon had asked for, and among them are a number of Latin works. This valuable library was burned at Brookhill House in Magheragall Parish by the rebels in 1641, to which place it had been moved for safety. Tandy seems to have been removed from Magheragall by 1650, for Dr. Weeke begins to receive the tithes in that year. The reference above cited may point to his having been Commonwealth minister at Hillsborough in 1658. There is a note in the Commonwealth Papers in the Record Office, Dublin, that he was to receive £60 as schoolmaster at Lisnagarvy from 10th of July, 1658 "as an addition to his tithe." It looks as if he was a "trimmer," and tried to keep in the good graces of the Government of the day. Taylor wrote to Evelyn on June 4, 1659: "I fear my peace in Ireland is likely to be short, for a Presbyterian and a madman have informed against me as a dangerous man to their religion, and for using the sign of the Cross in baptism. The worst event of the information which I fear is my return to England." The use of the plural "have" in the above, seems to imply two accusers, so we cannot be sure whether Tandy was the "Presbyterian" or the "madman." A letter of Lord Conway mentioned him by name in this connection:-- "I received a letter yesterday from Dr. Taylor which hath almost broken my heart. Mr. Tandy hath exhibited articles against him to the Lord Deputy and Council, so simple (as Col. Hill writes) that it should come to anything, the greatest scandal being that he Christened Mr. Bryers' child with the sign of the Cross. I have written to Hyrne to supply him with money for his vindication as if it were my own business. I hope, therefore, when you come over you will take him (Tandy) off from persecuting me, since no one knows better than yourself whether I deserve the same at his hands . . . The quarrel is, it seems, because he thinks Dr. Taylor is more welcome to Hillsborough than himself." Elsewhere he says:-- "Mr. Tandy may have enough of these (Annabaptists and Quakers) to set himself against, without troubling his peaceable and best neighbours." (quoted in Heber's Life of Jeremy Taylor.) Hence it seems likely that Tandy was the "Presbyterian." The Hearth Money Rolls for Magheragall Parish in 1666 give's Mr. Edward Brears; he is the only person in the parish who had more than one hearth (he had two), and, therefore, was most likely living at Brookhill, and the father of the child whose baptism is referred to. In a copy of Harris' Ware in T.C.D. Library there is a MS. note taken from the "Book of General Orders by the Commissioners of the Commonwealth for ye Govt. of Ireland" from 22 June to 12 Dec., 1659. It inns:-- "Ordered that Lt.-Col. Bryan Smith, Gov. of Carrickfergus, do forthwith upon sight hereof cause the Body of Dr. Jeremy Taylor to be sent up to Dublin under safe custody, to the end he may make his personal appearance before the sd Commrs. (of Govt.) to answer unto such things as shall be objected agst. him in behalf of the Commonwealth. Dated at Dublin 22 Aug. 1659." Lord Conway's character appears in a pleasing light when we read that Rawdon found a note among Tandy's papers (apparently after his death) that he (Conway) intended to give him £400 of his "arears." Rawdon adds-- "This will be a charity to his children, as his adventure land being put under the Doubling Ordinance will be cut short." The Cathedral Register of Lisburn records that Mrs. Mercy Tandy (probably his wife) was buried in 1703, aged 85 years, close before the Castle seat. She had been a member of the congregation, for in 1698 Mrs. Dorothy Lovel was "buryed before Mrs. Tandy's Pew in the old Ile." Letter to Montgomery of Ards. Hillsborough. Jeremy Taylor to Lord Viscount Montgomerie of Ardes, General of the Ordnance in Ireland, Oct. 27, 1660. I was a week since treated at Carrickfergus with great civility and nobleness by the officers, civil and military, and with great ceremony received. The delay of the consecration of the Bishops makes the ministers fancy that the King intends no Bishops in Ireland, and that keeps them off from complying. But they generally say that if they must have Bishops they are very glad they have fallen into my hands. I do not doubt, if God give me blessing and his Majesty any countenance to me and assistance by his civil officers, I shall reduce this Diocese to good temper and quiet uniform religion according to the lawes. But our delay does all the mischief that is done. My Lord, concerning your son I remember my promise, and am very ready to perform it, and shall esteem it a blessing to me if I might have the supervision of all the young nobility of the North, and much more of your son, whom for his father's sake I must diligently serve and take care of. In order to which I must tell your Lordship my present condition. I am shut up in a little house, where I have not room for my servants to lodge, but I am close to Hillsborough Castle, and it your Lordship will be pleased to let your son have a lodging in the Colonel's house with my chaplain, who lives there and who shall teach him under my eye and perpetual conduct, and this only till the Colonel or myself or your Lordship cause a chamber to be built for Mr. Hugh at my little house -- I will then send for him speedily and take the same care of him as of my owne. This winter I am forced to this bad shift, but as soon as I can get a house convenient I shall then put your Lordship to no further trouble, but be answerable to God, the King, and to your Lordship for the education of the child, and shall esteem it a favour that your Lordship will trust me with your jewel, whom I will keep and, I hope, restore to you with lustre and advantage . . . .